Bedroom TV was found to deprive the child of more enriching developmental activities and may explain, in part, less optimal body mass, poor eating habits and socio-emotional difficulties as a teenager, found new study published in Pediatric Research. "The early years are a critical period in a child's development," said study author Linda Pagani, a professor at UdeM's School of Psycho-Education, who will be discussing her study today at the International Convention of Psychological Science, in Paris. "Intuitively, parents know that how their children spend their leisure time will impact their well-being over the long term," said Pagani. "And with TV being their most common pastime, it's clear that the many hours they spend in front of the screen is having an effect on their growth and development, especially if the TV is in a private place like the bedroom." With their attention diverted, children risk not having enough physical and social interactions to promote proper physical and socio-emotional development, Pagani said. 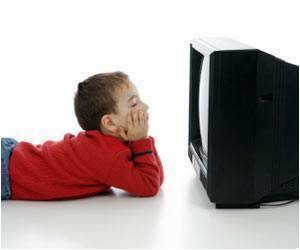 "To test that hypothesis, we longitudinally followed a birth cohort to examine whether there was a link between having a bedroom TV at age 4, during the neurodevelopmentally critical preschool period, and later physical, mental, and social problems in early adolescence. Our goal was to eliminate any pre-existing conditions the children or families had that could bias our results." Pagani and her team analyzed Canadian birth cohort data of 1,859 Quebec children born between the spring of 1997 and the spring of 1998, part of the Quebec Longitudinal Study of Child Development coordinated by the Institut de la statistique du Québec. Spending too much time watching TV in their room can harm preschoolers' development, an Université de Montréal study finds. To assess their health at age 13, independent examiners measured the childrens' body mass index; adolescents also reported their intake of unhealthy foods. To measure psychological problems, teachers rated how much emotional stress the children faced; the teens also completed a short version of the Children's Depression Inventory. For social problems, teachers reported on how the kids got along with their peers and whether they were bullied. All these measures are good predictors of later physical and mental health in adulthood. The study's results were clear: having a TV in the bedroom at age 4 made it more likely the child would later have a significantly higher body mass index, more unhealthy eating habits, lower levels of sociability, and higher levels of emotional distress, depressive symptoms, victimization and physical aggression, regardless of individual and family factors that would have predisposed them to such problems. "The location of the TV seems to matter," Pagani said. "The children in our study were born at a time when television was the only screen in the bedroom. Today, given the portability of digital devices and the constant switching from one device to another, the guidelines of the American Academy of Pediatrics clearly have reason to encourage screen-free zones and screen-free locations at home, especially given the implications for the growth and development of children. Our research supports a strong stance for parental guidelines on the availability and accessibility of TVs and other devices." The representation of childbirth in media such as television seems to influence the expecting mothers who seek out to understand childbirth and labor pain.